Tonight in Foreign Correspondent‘s “Running Amok” report David Lipson immerses himself amongst fear, violence and fanatical fans in Indonesian soccer. 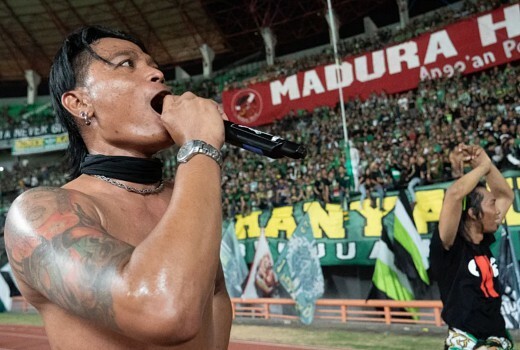 This is no armchair spectator sport…David Lipson ventures into the fanatical, often deadly, arena of Indonesian soccer. Can you imagine your favourite footy team getting to a game in an armoured personnel carrier? Ever been to a match where the visiting team’s fans are banned? Such is the fear and violence infecting “the beautiful game” in our near neighbour Indonesia. “Indonesia is like, insane.” Marko Simic, Croatian playing for Jakarta’s team Persija. Riot cops with automatic weapons are as much fixtures as goal posts. Brawling is the norm among the militias of fans and their commanders. Rumours of match-fixing swirl, fuelling crowd anger. “Everyone wants to watch the game – but then you see the enemy and then you fight.” Andibachtiar Yusuf, filmmaker and Persija Jakarta fan. About 75 fans have been killed in soccer violence in the past 25 years. In a recent eight-month period, 16 died. Thousands more have been injured. “He never asked for trouble. He was just watching a game.” mother of 23-year-old Ari, Jakarta Persija fan who was beaten to death by dozens of Bandung supporters. When fights erupt amid flashes of smoke flares and thunder of drums, games are stopped mid-way. Recently the entire league competition was suspended for a fortnight. It’s got so bad that some football fans are prepared to see the game shut down indefinitely. “Football in Indonesia has become a graveyard, not entertainment. Supporters’ lives should never be sacrificed for our love of football.” Akmal Marhali, head of NGO Save our Soccer. Correspondent David Lipson immerses himself among “Jakmania” – the Persija Jakarta fans who are as fiery as any in Indonesia – in their race for the championship title. His quest is to understand what drives such violence in a mostly Muslim nation that forswears alcohol. The word “amok” originates from this part of the world and was first recorded in the 17th century. It resonates today. In Running Amok, Lipson explores a fundamentalist fandom that’s become the ugly face of football Indonesian-style. 8 pm Tuesday February 12 on ABC.